Your website is created and maintained entirely through a web browser using JustType Tools™, our online Administration Centre, so you can manage and update your website 24/7 from any computer, anywhere in the world. The picture below shows a typical screen from the Administration Centre with a number of key features highlighted. (A) Simple expanding menus guide you to each of your webpages for editing. 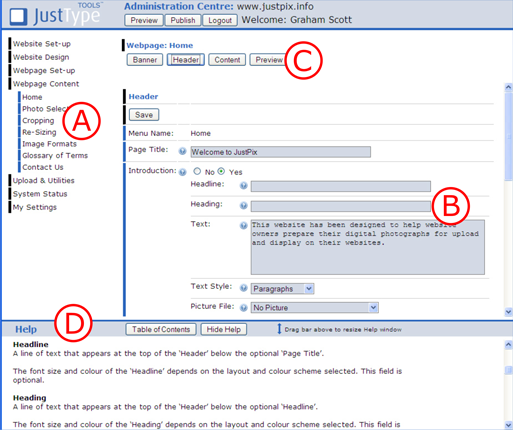 (B) Text that appears on your website is simply typed or pasted into on-line forms. (C) Click the Preview button to view your changes at any time, before publishing them live. (D) Help associated with the administration page you are using automatically appears in the frame at the bottom of the screen. Clicking the ‘?’ icon next to each field also provides specific help for that item in a small pop-up window.